1. Four months of writer's block, and then the instant I have a baby, it lifts, and all I want to do is write. Which, given my foggy, puffy-eyed, sleep-deprived state, doesn't really make sense unless I think about it this way: you know those moments when you've nearly drifted off to sleep, between waking and dreaming? And how that's usually when you have your most creative, unfiltered thoughts? I've written and promptly forgotten complete melodies, perfect turns of phrase, and entire poems during those moments (I've also seen my mailman walk around headless, fallen off airplane wings and cliffs, and watched my boss flip room-sized blueberry pancakes). Life with a newborn is like a steady stream of those moments (except I'm the one walking around in search of my head). The inevitable fog of sleeplessness, upheaval, and hormones mimic that dreamlike in-between state. My brain has no filters. I'm tired, and I don't have the energy to censor my thoughts. But it's 3 am and I'm stuck in this rocking chair for at least 40 more minutes, and maybe these uncategorized thoughts will make interesting material. Or, if nothing else, perhaps jotting them down on my phone with my one free thumb will help me stay upright in this chair a little longer. 2. The random stuff around my house is like space junk--it will sit there unchanged for all eternity until I muster up the willpower and energy to move it. Half-unpacked hospital bag, lone toddler sock, quarter of a graham cracker, unopened Amazon box, junk mail from the insurance company: I'm looking at you. 3. I'm not pregnant anymore! Sometimes I wake up in the night and remember this, and I giggle to myself a little. From the frying pan into the fire, I guess, but I've always been a bit of a pyro and the frying pan was a real pain. Also, in the fire I can drink wine. 4. I am currently fourteen days into an initiative I'm calling The Shower Project. This is a challenge in which I attempt to defy the expectations for new moms everywhere and shower once a day for the first three months of my daughter's life. So far I am 14 for 14 (except for Day 1, on which I did nothing but sleep, text immediate family, wolf down Chipotle burritos, and endure lectures from nurses). Granted, my husband has only just gone back to work, but I believe it's nearly always possible to make time for the things most important to you, and there is very little of more importance to me than a steaming hot shower. There have been a few exceptional times in my life that I've gone without showers--the time I spent in the African bush, for example--but I don't think this has to be one of them. I'm a mother, not a martyr. I might be "in the trenches," as they say, nursing a newborn and chasing a toddler, but I'm not *actually* fighting the Germans (or sleeping in a yurt by the Nile) and so I figure I can probably swing 15 minutes a day for a shower. Right? Well, we'll see. Stay tuned. 5. On baby gifts: I've spent half of my waking, non-nursing hours processing gifts and remembering to write thank you notes. I'm grateful, I really am, but this doesn't quite seem fair. It's like writing a thank you note for a thank you note. "Thank you for having a baby." "Thank you for thanking me for having a baby." 6. Coffe please. I mean, coffee. Please. 7. I showered tonight because I didn't remember that I showered earlier. I think that means I needed it. Also that I'm winning at my challenge (see #4). 8. One trait that I inherited from my grandmother is the inability to drink my coffee while it's hot. She was a habitual hot-drink abandoner. She'd fix herself a cuppa and promptly leave it on top of the tv. Or a corner of the kitchen counter. Or the bathroom sink. Only to find it an hour later, microwave it, and then neglect it again. My mom does this, too--I'll find her tea in the microwave, ice-cold. Jordan has a sweet way of asking me, "Did you find your coffee, babe?" which is 9-years-married code for, "I don't see you drinking anything, so clearly you lost or forgot your coffee again." I mention all this now because 1) coffee is high on the priority list these days, and 2) for once, it serves me well to drink cold coffee because I never have to worry about scalding the baby. Not a chance. 9. It took me until the second child to realize this life-changing fact: you don't have to use the middle snap on the onesies. It's completely redundant. For that matter, you really only need any one of the three. This realization has already bought me a solid 12 extra minutes of sleep. The parenting books always leave out the good stuff. Oh, and also: whoever designed the baby pajamas that have fifteen snaps on the bottom, all around the legs and ankles, clearly never changed a flailing baby at 3 am in the dark. Luckily, you can get away with using only one of those snaps, too...provided, of course, that you can overcome your OCD tendencies. 10. The primary function of second children is to prevent the first child from becoming overly spoiled. Their secondary function is to be a bib. I mean this literally. Three of Annie's onesies already have permanent ice cream and ketchup stains on the back from us dripping onto her. 11. Today, everyone cried but the newborn. Explain that one. 12. Strange sleep deprivation symptom: Sometime around 3:30 in the morning, I suddenly recalled the taste of my wedding cake. I hadn't thought about it in at least seven years. 13. To have a baby is to have a textbook adventure. You prepare without really knowing what to expect. Life and death are on the line. You set out with a sort of plan, yet you can never be quite sure where you'll end up. Your spontaneous side will really come in handy. You might lose your sense of direction along the way. You'll probably eat some weird food, take a lot of pictures, and sustain some sort of injury. You keep telling yourself "this will be worth it," and ultimately it is, although you might not believe it until much later. Later, you'll be glad you risked so much. 15. The weekend before Annie was born I made batches and batches of sweet rolls--cinnamon, cinnamon pecan, lemon, blueberry, lemon blueberry--for the freezer. 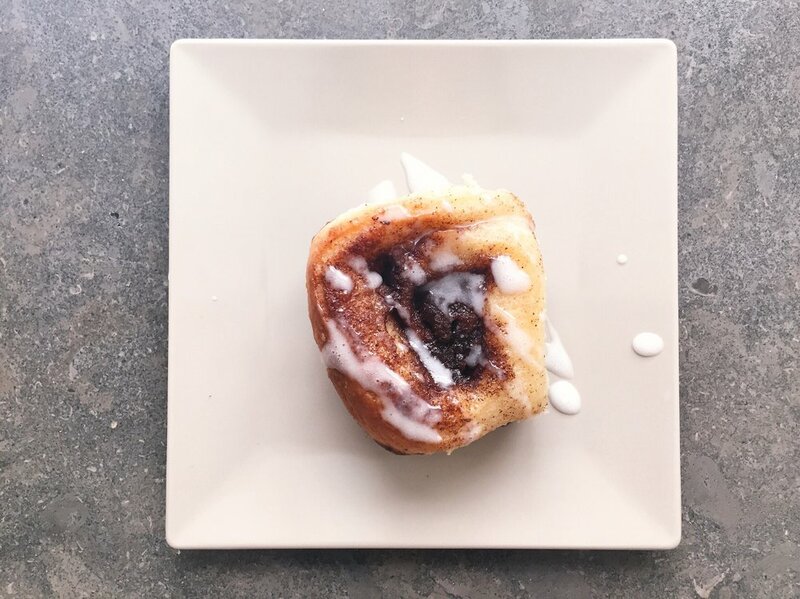 It seemed like an idiotic thing to do at the time, but there was a method to it: I figured, having a newborn for a roommate is no joke, but at least I'll be able to sit around and drink coffee and eat sweet rolls. So far, my plan is going swimmingly. And sweet rolls taste great at 3 am! 16. Everyone says, sleep! sleep! sleep! Well, I'm one person you don't have to explain the merits of sleep to. And yet. There's medicine for your body and there's medicine for your spirit. On one of the last nights my mom was in town, we stayed up until 11 pm decorating a single key lime tartlet that my mom had made for the heck of it. Here is how it happened: first she decided to make the pie. Then, there was a little filling left over, enough for a tartlet. Which called for whipped cream, so she ran out to buy some. Then I showed her how to pipe it on, because she's always wanted to learn. We added slivered almonds. Then we remembered that we had fresh mint in the fridge, and a blueberry, and a tiny bit of raspberry sauce left over from a dessert that Jordan brought home. And, standing right there at the kitchen counter, we shared our Michelin-starred, completely unnecessary two-person tartlet, and I realized that some things are worth their weight in sleep. 17. I've always been inclined to have a vague sense of dread about the future, ever since I was very young, irrespective of how well or poorly life is going. I feel that dread creeping in occasionally these days, and it usually comes from thinking too far ahead. Having a newborn is a crash course in not worrying about tomorrow. It's also an exercise in not giving too much thought to my worst fears: not living up to my own expectations; being alone; losing all inspiration. I've been thinking a lot about a conversation I had just a few hours before Annie's birth, about how some of the best art comes out of the roughest, darkest times, out of upheaval and the unexpected. Brand new experiences give you new colors and phrases to work with, a new depth of hues and notes and ideas. And there's not much in the world that's newer and fresher than a newborn baby, so I'd like to think that means there's a world of inspiration ahead.